Right before our very eyes are the tremendous migratory phenomena of these our times, but we nonetheless have the distinct feeling that we cannot explain them in full. We are very familiar with the data, even if few indeed are the patient analysts who make an effort to collate and compare said data and explain them in suitable terms. Then again, the mass media makes superficial and emotive use of such material. Data alone, however, do not suffice to explain this massive phenomenon destined to alter the order of things both globally and within our western societies. Widespread is the sensation that there is something “behind” all this, and that what is projected as a sudden and spontaneous phenomenon actually conceals not just organization, but deliberate planning. There are economic reasons that do have an influence on this phenomenon, but fail to explain it completely. From an economic point of view there are many dark spots. For example, illegal immigrants from Senegal and Ghana do not come from countries in the grips of violent conflicts or without fairly good economic prospects for the future, and they land in countries like Italy where the per capita GDP has been in a tailspin since 2001 and unemployment is rampant. Economic reasons do not explain migration like this. Nor is there anything akin to an explanation in the alleged economic reasons for receiving them. The cost of hosting an immigrant is higher than the economic contribution he can make to the host country. Untrue is the cliché that immigrants guarantee the payment of pensions in a country like Italy, for example, where the total number of job holders is decreasing in comparison to the number of retirees. Immigrants do not replace the empty crib, and an immigrant does not make up for a child unborn. Only the minority of those immigrants with regular jobs contribute to the national social security system, and in the meantime the costs of reception sap any possible future benefit from the outset. Nor is it true that coming to Europe are only the poor persons who would otherwise die of hunger in their native countries. Yes, there are such cases, but data reveal that often departing are fairly well-to-do persons seeking to further improve their own situation and not just survive. Moreover, the tariffs charged by human traffickers are not within the grasp of one and all. Convenient sociological explanations such as, for example, migrants fleeing from countries impoverished by the western exploitation that has colonized them in a political and then economic sense for such a long time just don’t hold water. In fact, it is evident that the difficulties in the development of some countries, for example African ones, are also endogenous and go by the names of corruption, tribalism, and ancestral superstitions. Pauperism and third world related interpretations serve no purpose in trying to explain the current exodus underway. Alongside economic or social causes, there are also political causes, or rather geopolitical ones. In actual fact, the refugees who flee from such situations and obtain asylum in a host country are few in number since the vast majority of immigrants are illegal ones. Nonetheless, it is a well know fact that the main reason for taking flight from Syria, Iraq, Eritrea and Nigeria is the political situation and hence the danger of death or probable persecution. From this point of view it is necessary to flag the political responsibility of the countries that wield power in the world. It is difficult to deny that the destabilization of northern Africa, and Libya in particular, the disorders that have emerged in Iraq, and the birth of the bloodthirsty caliphate of ISIS overlapping Syria and Iraq conceal responsibilities on the part of the world’s main power brokers, especially western countries. Migration from these places can be considered forced due to the situations and conditions that have emerged, and perhaps even planned. From this point of view how else can be look upon the extinction of Christianity in the Middle East? Nor can silence reign about the inertia of international politics with regard to the barbarity perpetrated in Eritrea and Nigeria. 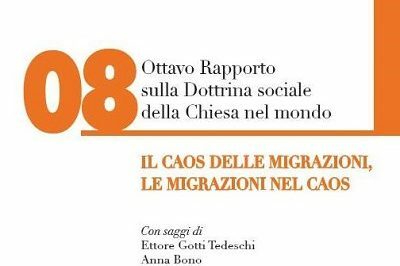 As we gradually delve deeper and deeper into the issue of the epochal migratory movements of the XXI century it becomes increasingly clear that these are not spontaneous phenomena triggered by objective situations created due to reasons of force majeure, but something willed or even imposed. Let’s return to the anthropological reasons for emigration. It is hoped that the declining birth rate in western societies, manpower motives, and especially the succession of generations in order to avoid a persistent decline in the population would be compensated for by the ‘newcomers’, who, among other things, are now more prolific than we are. This situation of a vacuum that has to be filled was planned and willed, and did not see the light of day in any spontaneous way. For decades, international agencies and organizations, governments, and major foundations in the United States have been resolutely committed not only to deterring any pro-family and birth rate incentives, but also to promoting abortion and the use of contraceptives, to enhancing individualistic and sterile life styles. These are phenomena illustrated with detailed documentary support in our previous Reports, from the transformation of the concept of woman, to the forced and systematic promotion of the gender ideology, and globally financed transhumanism projects. Therefore, if anyone sustains that the main cause behind migration is the need to fill the demographic gap of the western world, it should be known that this gap was created on purpose, and perhaps also in order to artificially produce the ‘need’ for migratory phenomena. Said phenomena are now both structured and organized. They are managed by an international criminal network and there are even tariffs according to the various destinations migrants wish to reach. Naturally, this neither eliminates the risk factor nor avoids migrants having to travel under inhuman conditions, and all this is further worsened by the ruthlessness of the human trafficking organizations themselves. This, however, does indicate that it would be possible to take action against such organizations through joint efforts on the part of the forces of law and order, but so far this hasn’t even been attempted. The existence of these organizations and their impunity insofar as beyond the reach of any political control show that planned are the migratory phenomena certainly based on real needs, but not fortuitous ones. Upon arrival in the host countries, the majority of the immigrants are illegal ones. The refugees and asylum seekers are a small minority. The surging flow of illegal immigrants is so strong that it is practically impossible to stem it. These persons often run away from the initial reception and processing centers if their ultimate goal is not the country where they first landed. Long and expensive is the time required to examine their effective status. Gradually emerging is consensus around the idea that those who expatriate simply to have a better standard of living impossible to attain in their homeland, that is to say someone who is neither a refugee nor an asylum seeker, also has a right to humanitarian assistance, reception and integration. The category of illegal immigrant, however is being applied to an unspecified number of persons, and hence any quota system becomes impossible, just like any entry screening process. Therefore, if a country eliminates the category of illegal immigration altogether, it will become the destination of migration with proportions impossible to calculate. In other words, such a country becomes a victim and is no longer an active stakeholder. This endangers the concept of common good and prevents a country’s political authorities from pursuing it. This cannot be accepted. After reception in a country there is then the issue of integration, and the situations and views of western host countries differ considerably on this. The German system works fairly well, while the Italian one doesn’t even exist. Lacking above all, however, is a common idea of integration. What does this word mean? The ‘multi-culture’ solution has failed, but hasn’t been replaced by anything else. Evident here is the main shortcoming of western countries. That multi-cultural solution consisted in receiving groups of immigrants who were homogeneous in terms of culture and religion, and permitting them to continue practicing in the host countries what were their forms of social integration as closed groups. Some people had spoken about ‘Balkanization’. In European countries there would be numerous autonomous enclaves living the life proper to them. Then again, immigrants today maintain relations with their native countries through Internet, Skype and mobile phones, and have more offspring that the families of the host countries. This makes the process of integration all the more difficult. These immigrants can remain who they are, while at the same time seeking to take advantage of the western social state. These are reasons why many observers retain integration to be impossible. One of the reasons why this is difficult or impossible is the cultural vacuum in western host countries. Their lack of identity, which has collapsed under the pressure exercised by laicism and nihilistic individualism, means they have nothing to either oppose or propose to these newcomers. Accepted in the exasperated pluralism of western societies are unacceptable cultural visions and social practices, such as, for example, the phenomenon of baby-brides and polygamy. In England, the Islamic sharia is accepted as part of the common law judicial system. The French ban on the public exposure of religious symbols projects, on one hand, resolute and aggressive laicism that in itself resembles a religion, and thereby contradicts itself, while, on the other hand, it reveals the non existence of any proposal, almost as if the laïcité had become a sort of nudité. Therefore, the multi-cultural and multi-religious nature of future western societies is nowadays presented as both the optimal solution and a source of cultural richness for all. Diversity, people say, is a good, and beneficial to one and all are the respective diversities. The mono-cultural society or the society with a prevailing culture is considered a thing of the past, something both weak and intolerant. International organizations and centers of power and influence in the world are pushing in this direction, and hence society of the future will be multi-cultural and multi-religious in a forced and imposed manner, and migratory phenomena seem to serve such a purpose. There are nations and countries that strive to react to this multi-cultural perspective, making efforts to defend their own national and historical identity in order to render it compatible with the economic progress that discourages isolationism. This is the case of the eastern European countries that are bonded to their national identity more so that their western counterparts, and are still immune to the leveling effect of membership in the European Union. In fact, the latter has been working so far against the identities of nations in an effort to implement a crosscutting European counter-culture created at the drawing board by bureaucrats in Brussels and by economic power centers instead of coming from the ‘bottom up’, born of the selfsame life of nations. The cultural leveling under way within the European Union mirrors the massive entry of immigrants in order to make a multi-cultural European society a concrete reality. As we can see, it is imposed multi-culturalism. Not necessarily, however, is a multi-cultural society more peaceful, more constructive and better. It may also be more conflict-prone, and this is why the possible successive passage could be to construct a new conventional culture and a new civic religion to be embraced by all citizens. A sort of new Kantian project for a ‘perpetual peace’, or something close to the Masonic or Gnostic aims of a universal religion putting an end to cultural and religious conflicts by uniting one and all in a super culture and super religion of humanity. In the past, from Saint Simon to Comte, many were those who engaged in this ill-omened effort. The multi-cultural society would therefore be only a step or passage towards a single thought society managed by international entities and world power centers, and imposed on all nations weakened from within by multi-culturalism. In this overall context, Islam calls for a special approach. Unacceptable is an Islamization of European countries, and hence indispensible are particular forms of migratory policies with respect to Islam. This religion includes features of integralism that are incompatible with both the history of the west and Christianity. It is true that Europe has also had Muslim components in its history, but in the past these were integrated within the Christian vision. Consider, for example, the philosophy of Averroè which, left unto itself, would have created numerous problems for the Christian religion and for society, but was surpassed by the Catholic synthesis of St. Thomas Aquinas. Moreover, Islam’s vision of God is non personalistic, and is a summons to submission rather than relatedness. This is why, as Benedict XVI said in Regensburg in 2006, not always does it consent the relationship with reason, that is to say the relationship which is the basis for the distinction (but not the separation) between nature and supra-nature, between world and God, which in its turn is the basis for sound and legitimate laicity. Islam does not guarantee all the aspects of the natural moral law, not does it sustain the need for the law of the State to respect the rights and responsibilities of the individual. For western and Christian tradition the right of the family precedes that of the State, as well as that of religion. But it’s not like that for Islam. Lastly, there is the issue of violence. In Islam there is no single doctrinal authority, and hence the Koran is read in different ways. There are no doubts that it also contains sure summoning the faithful to violence, but, at least theoretically, a moderate Islam does exist. The lack of a single Islamic authority, however, will not prevent, today and in the future, the existence of a aggressive, exclusivist and violent Islam, above all with respect to Jews and Christians. In the landscape of migratory policies and the future multi-cultural and multi-religious society imposed upon us, Islam therefore calls for a particular effort of evaluation, and the western countries are not prepared for this. Noted in the wake of the numerous terrorist attacks of Islamic matrix has been an underestimation of the phenomenon, almost as if Islam had very little to do with it, or was only involved by chance. Nor is there any serious investigation underway into who finances the construction of mosques, no controls over them or other Islamic cultural centers in Europe such as, for example, the Islamic universities, and no controls over the preaching of imams, which often assumes violent tones. Deportations always take place after the attacks, and not before, and no one really ponders why the attacks are always the work of second generation Islamic immigrants, who should have felt integrated. The western world does not want to protect Christians from persecution on the part of Isis or BokoHaram, so how could we even imagine it might have the force to expect reciprocity: a Christian church constructed in Muslim countries for each mosque construction in the west. This weakness is frightful and projects a sinister light on migration in general since many are the migrants who embrace Islam and hidden among them are possible future terrorists. An uncontrolled migratory process pursuing a multi-cultural and multi-religious society to be surpassed at a later stage by a syncretistic universal religion also seems to serve the purposes of the secularization and elimination of Catholicity. In this perspective the latter will have to forego its claim of uniqueness and specificity and flow into a religion of the United Nations or in a United Nations of religions. There are known to be projects designed specifically to this end, as well as declarations of intent oriented in the same direction. The Magisterium of the Catholic Church, and in particular the recent Petrine Magisterium, is especially focused on highlighting the fraternal duty of receptiveness towards those in need. This is a teaching of the Gospel. The complex nature of the issue at hand, however, also calls for other measures at other levels likewise animated by the fraternal duty of openness which must not be blind, but must endow hope with structures. The Holy Father’s invitations to be receptive towards others does not dispense anyone from knowing about the manifold facets of the issue and implementing necessary strategies at the diverse levels of competence. Quite on the contrary, they so require. It must be noted that for some time the social teaching of the Church has been overlooking in-depth work on a theme which has a very important role to play in this matter of immigration and its related problems. I am referring to the theme of the ‘nation’ and its cultural identity, which necessarily places it in relationship with the question about God and hence with religion. The last person to deal with this in a systematic fashion was St. John Paul II in Centesimus annus, numerous addresses, and in the book Memory and Identity. Man is incomprehensible – as he taught – except within the culture of his nation and in the memory of his own identity. This is where the relationship with God becomes manifest in full, while visions of the cosmopolitan man such as those issuing forth from the French revolution and the culture of the Enlightenment prevent the relationship with God, leveling off man as individual within an abstract and purely quantitative humanity. In the ‘nation’, on the contrary, man discovers an organic and life-giving entity that enriches him. Of core importance in these considerations of St. John Paul II must have been the history of Poland, the memory of whose identity was one and the same with the memory of the Church regarding its identity. This is why Poland is now the most reluctant among the nations of the European Union as regards taking upon itself the models of reasoning imposed by Brussels, and also the nation mounting the most resolute resistance against that forced immigration whose aim is the multi-cultural society that is the negation of ‘nation’. It is not opportune to underscore the globalism of human togetherness alone and forget the reality of ‘nations’ with which evangelization has always had to come to terms insofar as concentrating on the concrete person ever within a specific cultural context and not the abstract man of the Enlightenment or the modern global and technological society. The Christian conception of the unity of humankind has an undisputable theological foundation in the common nature of the children of God the Creator, but is organically rich and does not refuse the individual’s belonging to national identities which as such are in relationship with the religious dimension. It is interesting to note that African bishops in general seek to dissuade their people from emigrating, calling on them to work hard to improve the situation in their own nation. Various possible dangers may be seen in overlooking the theme of the ‘nation’. The first is that migratory phenomena are looked upon as the migration of persons as individuals, and not as migrations of peoples, cultures and religions. This would be a most serious mistake. The second danger is that lost would be the possibility to reason properly about the common good, pursuing it as well through migratory policies. When the political leaders of a host country open the doors to migrants they must also take into consideration the common good of their own political community and preserve the identity or the cultural identities that constitute its living memory. Thirdly, there could be a very dangerous slipping on the part of the Church into the language and the mentality of today’s international organizations. The Catholic Church, however, cannot use the same ideological, pacifist and ecologist language of the United Nations. Insufficient today are the ways and means deployed for dealing with migration. This phenomenon has to be governed, but in order to do so it is necessary to know what it really is. Phrases from the Gospels can also become ideological slogans if they are used to hide reality from view instead of taking it into consideration. Undertake to resolve the problems in the countries of origin, strike hard against the networks of human traffickers, do not create situations of warfare piloted by western powers in those countries, take military action as well against the bloodthirsty caliphates instead of financing or indirectly supporting them, protect persecuted Christians, expect and claim equality with Islamic countries, monitor the entry of Islamic immigrants, have a clear idea about a platform of values that immigrants would be expected to share, provide initial assistance to all, but refrain from hosting and integrating one and all, protect and defend one’s cultural and national identity, protect and defend one’s Christian and Catholic roots, do not motivate receptiveness with inexistent economic arguments, focus on increasing the birth rate in our countries with suitable family and demographic policies, mount opposition against the efforts of the supranational nomenclatures to reduce persons and peoples to the same level and the imposition of single thought by international organizations. Here we have a list of ways of thinking which could be useful in better governing the epochal migratory phenomenon now underway. Director of the Observatory Cardinal van Thuân on the Social Doctrine of the Church. This introductory synopsis is also underwritten by: Fernando Fuentes Alcantara, Director of the Fundación Pablo VI, Madrid; Grzegorz Sokolowski, President of the Social Observatory Foundation (Fundacja Obserwatorium Społeczne), Wroclaw (Poland); Daniel Passaniti, Executive Director of the CIES-Fundación Aletheia, Buenos Aires; Manuel UgarteCornejo, Director of the Centro de Pensamiento Social Católico of the Universidad San Pablo di Arequipa, Peru. 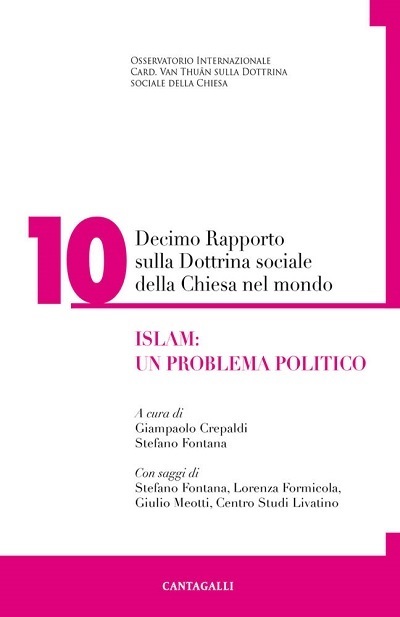 Silvia Scaranari Introvigne, La guerra “a pezzi” e le nuove guerre di religione, in the VII Report on the Social Doctrine of the Church in the World, Cantagalli, Siena 2015, pgs. 149-164; Id., Violenza e pace di vecchi e nuovi califfati, in AA.VV., Le nuove guerre di religione, Cantagalli, Siena 2016, pgs. 69-80. This was recalled, for example, by the European bishops in the press release after the Assembly of the Council of Episcopal Conferences of Europe (CCEE) held in Jerusalem from 11 to 16 September 2015. John Paul II, Encyclical Letter Centesimus annus (1991) n. 24. John Paul II, Memory and Identity , Rizzoli, Milan 2005. The theology of Karl Rahner and the euthanasia of the Social Doctrine of the Church. Let’s begin a discussion about Rahner’s theology.